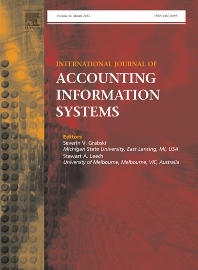 The International Journal of Accounting Information Systems will publish thoughtful, well developed articles that examine the rapidly evolving relationship between accounting and information technology. Articles may range from empirical to analytical, from practice-based to the development of new techniques, but must be related to problems facing the integration of accounting and information technology. The journal will address (but will not limit itself to) the following specific issues: control and auditability of information systems; management of information technology; artificial intelligence research in accounting; development issues in accounting and information systems; human factors issues related to information technology; development of theories related to information technology; methodological issues in information technology research; information systems validation; human–computer interaction research in accounting information systems. The journal welcomes and encourages articles from both practitioners and academicians.